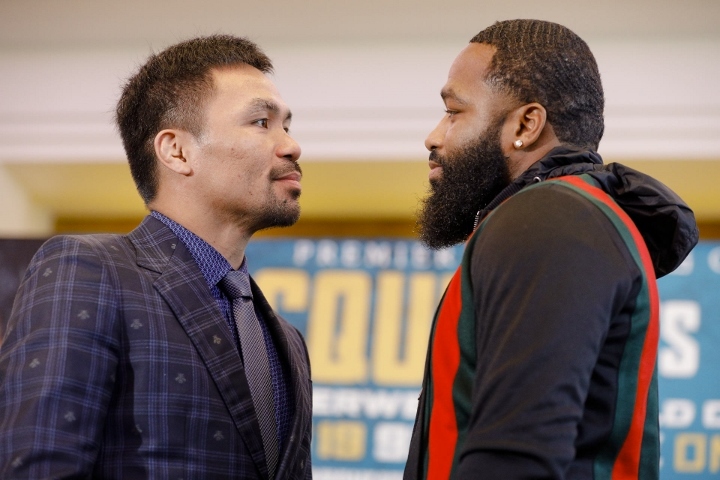 World Boxing Association (WBA) “regular” welterweight king Manny Pacquiao is not concerned with the recent arrest of his upcoming opponent, Adrien Broner. Broner, a four division world champion, was arrested on Sunday – due to an outstanding warrant related to several missed court dates for past traffic violations. Pacquiao will defend his title against Broner on January 19th at the MGM Grand in Las Vegas. The contest will headline a Showtime Pay-Per-View event. Broner was quickly released after posting bail and is currently training as scheduled with head coach Kevin Cunningham. While some Pacquiao camp members are concerned with Broner’s pre-fight troubles – the Filipino superstar has no worries. “The fight is a go. Broner was arrested for another brush with the law but he was able to post bail,” Pacquiao declared during an interview with Philboxing.com shortly after his road run at the Pan Pacific Park. Broner is no stranger to legal issues. He’s been arrested numerous times in the past for a variety of issues. Last week he was sued for over $1.1 million in unpaid jewelry bills. Raides “Nonoy” Neri, the assistant strength and conditioning coach, is very happy with Pacquiao’s progress in camp. “Obviously, our fighting senator was able to get enough rest last night. I noticed, he performs well when he is well rested,” Neri said. The contest will be Pacquiao’s first bout in the United States in over two years. The last time Pacquiao saw action in America, was back in the fall of 2016, when he won a dominant twelve round unanimous decision over Jessie Vargas to capture the WBO welterweight title. Pacquiao would fight in Australia in 2017 and then in Malaysia back in July.